joanofdark.com: Paramore Decode hat is DONE! Paramore Decode hat is DONE! Had to rip a bunch back earlier, but this sucker is DONE! It's a crappy cell phone pic for now. Forgot to bring my card reader home from work. Dude, you are amazingly fast. I was sure you'd get it done, though. Tell me how Twilight was after morning rush, yeah? Awesome. 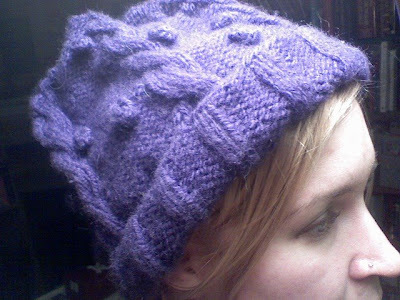 I've been obsessed with knitting this hat lately, but I thought it was different so now that I've seen the actual hat (google image searched paramore purple hat LoL!) I've decided to go with how I *thought* it looked. Sigh.